We are exactly one week away from Thanksgiving. YASSSSS! I'm a little overwhelmed with my own excitement, to be completely honest. Excitement aside, if you're hosting, seven days out means it's time to get to work. Fun work though, obviously! I personally think a great place to start is your tablescape. Let's do it together, shall we? I created this little mini tablescape in legit like five minutes. I only used dishes/props that I already had in my home (FREE!!) and got the fallen leaves from under one of my neighbors trees (SCORE). The beauty of tablescapes is they can literally be anything you want. You want fancy? Get fancy. You want organized chaos? Make it chaotic. It's whatever YOU want. And no matter what route you go, odds are it's going to look amazing. Plating: Do not buy new dishes! Use what you already have! Grab two different size plates and stack them on top of each other. Ideally you would have one large dinner plate and a small plate for salad/appetizers. They do NOT need to match. In fact, it's probably more fun if they don't match. Serving soup? Place a bowl on top of the small plate. Again, it doesn't need to match. Utensils: I pulled out my spare set because they are matte and I think they looked better with this theme. Tie a little twine around them, make a pretty bow, and call it a day. Cloth: I used some old burlap I had laying around. I cut it into squares, folded the cloth in half and then placed it between the two plates. This can be done with any type of cloth or with the napkin cloths you will be using that day. Glassware: I used some old jars I had on hand, which the rustic chic-gal in me adores. You could also serve a tall wine glass alongside the jars or just any fun glasses that you have on hand! Table props: This is where you get to have some fun. I gathered some fallen colorful leaves from outside and placed them along the center of the table. A good contribution to this idea would be a few candles, different sizes, placed throughout. Fresh fruit such as pears, tangerines, or mini pumpkins also look really cute. DIY Menu: I think this is what really pulls it all together. Make little DIY menu cards for each guest. 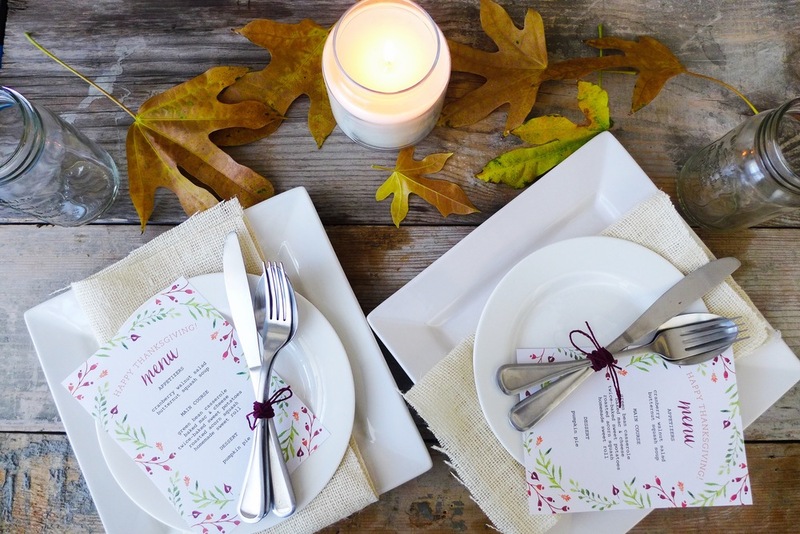 There are HUNDREDS of printables made specifically for Thanksgiving menus that you can download and print right from your computer. The menu cards I used here are from Elegance & Enchantment and I think they are wonderful! I hope this was helpful for you! Like I said, if you're hosting go ahead and knock this off your checklist! It's an easy one to get out of the way in advance. What theme are you going with for Thanksgiving? Let me know in the comments below!